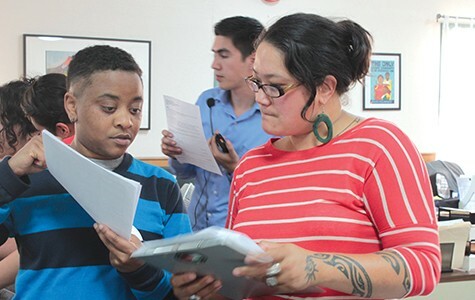 Skyrocketing rents and housing costs are forcing many residents out of Oakland, and activists say the city has been moving too slowly to solve the problem. Robbie Clark (left) of Causa Justa/Just Cause says soaring rents are creating "incentives for landlords to push tenants out." While Oakland officials are heralding 2015 as a boom year for development, many of the city's residents are rapidly being driven out of town by soaring costs. And the rising cost of housing feeds on itself, increasing land values and creating "incentives for landlords to push tenants out," said Robbie Clark of Causa Justa/Just Cause. Clifton and Mercedes Harrison, for example, have lived for thirty years in a rent-controlled apartment in the now-red-hot neighborhood of Adams Point. Clifton Harrison said that since 2011, the building owner has been "trying to annoy us so we throw up our hands and move out" of the apartment in which they raised their kids. "If we moved out they could raise the rent to market rate," he explained. Harrison cited a series of frustrations: a bathroom leak that was not fixed for a year, creating mold and mildew and eventually worsening to the point where they had to move out for repairs; an illegal eviction notice issued on the grounds that repairs required the apartment to be empty; and now an attempt by the building owner to double the rent because the repairs increased the value of the apartment. As long-time residents move away, crowd into too-small apartments, and become homeless, affordable-housing advocates say the city's development plans don't do enough to address these urgent problems. "The question is, who are we building Oakland for?" asked Alvina Wong of the Asian Pacific Environmental Network at a city Planning Commission meeting in November. 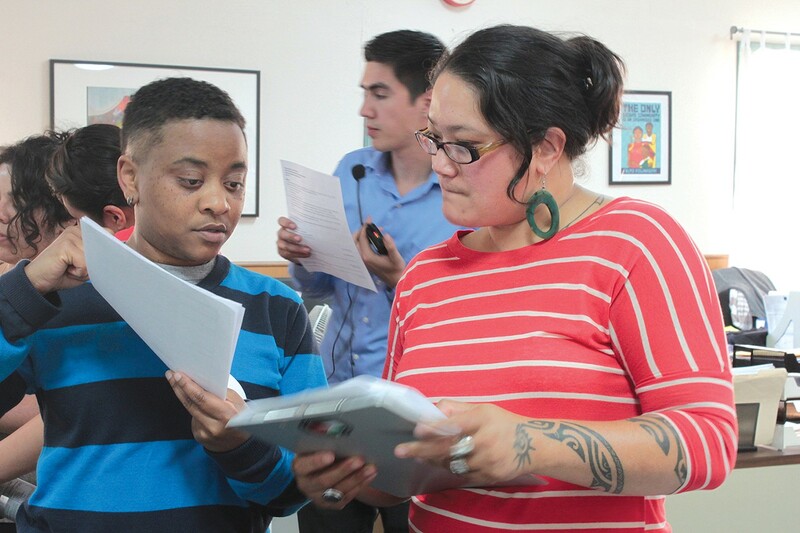 In a recent interview, Oakland Housing Director Rachel Flynn addressed that question. "We're looking at all income levels — how we can meet the needs of Oakland citizens and people who want to come here, from very poor to wealthy," she said. But most of the housing planned for future development will be market-rate, which often means rents of $3,000 or even $4,000 a month — way beyond the reach of most Oakland residents, half of whom are officially classified as low-income. Recently, the city council adopted some significant policies to prevent the exodus of Oakland's current population, but many activists say the city is taking so long to act that it's losing the race against displacement. "We're in a state of emergency," said Janny Castillo of St. Mary's Center, which provides services to children and seniors. "Families and seniors are living on the streets and in cars." As rents skyrocket, low-income people who turn to affordable-housing developments find that waiting lists are years long — or closed altogether because they're oversubscribed. The unmet need for affordable units is so dire that it has inspired some residents to become advocates for building more. Stacy O'Neil, now living in an affordable-housing development in Uptown with her two children, fourteen and eleven, said she became an activist for affordable housing "because I believe everybody should have a place to live. I've lived in motels, slept in cars, been in shelters. The worst thing is to put your children through that — not to have a place to go home to." But official goals for building affordable housing fall far short of matching the need. Jeff Levin of East Bay Housing Organizations pointed out that the city's new "Housing Element," a policy roadmap for the next eight years, classifies more than 50 percent of Oakland's population as low-income but plans for only 30 percent of the new housing to be for low-income residents. Some policy statements aim even lower, like the 15-percent-affordable goal declared in the West Oakland Specific Plan. And even these goals have a potential fatal flaw: lack of clear strategies for funding. State and federal funds for affordable housing have dried up or slowed to a trickle. For a while, some cities required developers of market-rate housing to make a percentage of their units affordable, but in 2009 a Southern California court declared such "inclusionary zoning" illegal. Last year, Governor Jerry Brown vetoed a bill that would have restored inclusionary zoning, writing that as Oakland mayor, "I saw how difficult it can be to attract development to low- and middle-income communities. Requiring developers to include below-market units in their projects can exacerbate these challenges." In the face of this funding drought, the city council has taken a couple of steps to add to the meager supply of affordable housing money. The city now earmarks for affordable housing one-quarter of the money it used to receive from the state in redevelopment funds. And in 2013, the council authorized the creation of a market-rate housing "impact fee," based on the idea that new luxury housing will increase the city's need for infrastructure — and for affordable housing. Levin said researchers have shown that market-rate housing, inhabited by the well-to-do, increases demand for low-income workers — restaurant staffers, housecleaners, and other service-providers — who then need housing. City officials cite this impact fee as the biggest current hope for funding affordable housing. Most affordable-housing advocates like the concept of an impact fee but worry about how it will play out. In order to establish the fee, the city must do a "nexus study" to get the numbers: How much need for infrastructure and affordable housing will new market-rate housing create? And then, how much of that cost will the city collect from developers? Throughout 2014, whenever residents demanded that plans for their neighborhoods include impact fees for affordable housing, city officials assured them that a citywide impact fee was coming soon. For example, Planning Director Flynn told the Express last summer (see "The Fight to Develop West Oakland," 7/9/14) that the fee would probably go into effect in early 2015. Later, city officials said that this schedule was unrealistic. City officials finally signed a contract for the nexus study in December, with the goal of creating an impact fee by December 2015 — or at least by March 2016. But at a December city meeting, incoming Mayor Libby Schaaf warned, "I don't want anyone to have the expectation that the council is going to adopt a fee and implement it immediately ... we have to give business owners a number of years to work it into their calculations." She noted that the city had delayed implementation of a similar fee for commercial developments for three years. These delays — and the prospect of years more — leave affordable-housing advocates seething. "Every day that we do not have an impact fee affordable-housing dollars are lost," said Castillo of St. Mary's at the same meeting. Flynn responded in an interview that only a small number of market-rate developments would likely get underway in the year before the impact fee takes effect. "I suppose there could be a project or two, but I don't see a critical mass," she said. Another concern is that whatever the impact fee turns out to be, the funds it generates will be divided up — to pay for transportation, infrastructure, and city services. As a result, affordable housing could end up with only a small slice. "What worries me is that they're wrapping together the trivial and the profound: sidewalk improvements, which developers will pay for anyway, with affordable housing," said Naomi Schiff of the Oakland Heritage Alliance. While building new housing could take years, there are steps the city could take immediately to protect low-income residents, activists say. Equally important as new affordable housing is preserving the existing affordable-housing stock, said Clark of Causa Justa/Just Cause. Rent-controlled apartments, he said, are a "finite resource" — when people move out, rents can go up to whatever the market will bear. So his organization is focusing on measures to "help people stay where they are." The Tenant Protection Ordinance, passed by the council on November 5, was a victory in that campaign. The law sets penalties for property owners who harass residents with the goal of pressuring them to move out, with tactics like those used against the Harrisons. But there's a catch. At the moment, the only way to enforce this policy is for the tenant to sue his or her landlord. Councilmember Dan Kalb, who introduced the measure, said his goal for the new year was to move quickly to set up a user-friendly administrative system to enforce the ordinance. That will take another council vote — and funding for administrative staff. In addition, Clark said, unhealthy conditions force many tenants to give up rent-controlled apartments. In 2015, his organization and other community groups will be pushing for "proactive code enforcement." The City of Los Angeles, Clark said, has "a pretty significant program with a huge enforcement department," which systematically inspects housing for code violations instead of waiting for tenants to file complaints. Fines from building owners with violations help fund the operation, but this, too, would require an allocation of city funds. Levin of East Bay Housing Organizations (EBHO) and other housing activists also want the city to leverage one of its underused assets — public land — to create more affordable housing. City-owned land, Levin said, could be granted or sold at low cost to affordable-housing developers. At the least, he said, affordable-housing developers should get first crack at buying any land the city is selling. If that doesn't work, the city should devote a percentage of the sale price to the creation of housing for very-low-income residents. The city, for example, owns a significant percentage of the land in the next area coming up for development planning: the neighborhood around the Coliseum. The Oakland Community Land Trust is also working on a new model for low- and moderate-income home ownership: The homeowner buys the house, but the Land Trust owns the land, which it leases to the homeowner with a 99-year renewable lease. If the homeowner sells, the sale price must be affordable to a buyer in the same income range. That way, explained Steve King of Urban Strategies, "every subsidy is preserved forever — the unit will stay affordable." The Land Trust has acquired, rehabbed, and sold nineteen single-family houses. Buyers, King said, mostly come from Oakland, with a few from nearby places like San Leandro. The Land Trust wants to expand to include more single-family houses and small multi-unit buildings. Money from sales goes to the city, supposedly to fund the purchase of new land, but the city and the Land Trust are still working out the details. "This is not a short-term fix, but a long-term solution," King said. "It's an opportunity to make some strides now that will serve the city forever."